Let the children in your life know that you notice and appreciate their many amazing personal qualities. 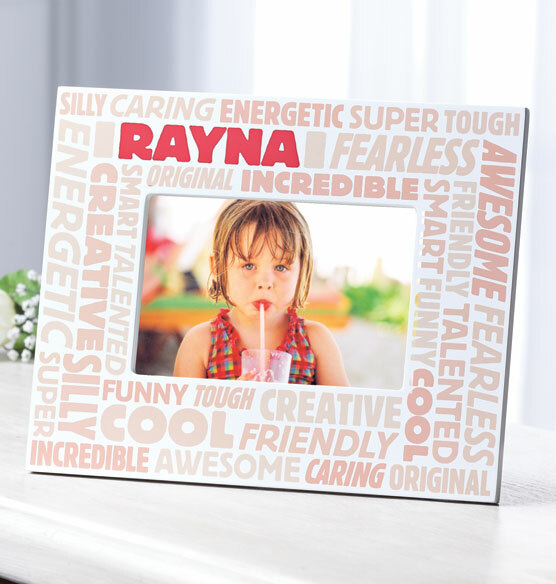 This complimentary personalized Word Cloud photo frame for children is filled with complimentary words that will make any child smile. If they ever doubt themselves, this personalized picture frame can serve as a visual reminder that you believe in them. The assorted positive words are printed in several fun fonts and colors, along with the child’s name. The back has both an easel stand and sawtooth hangers, so it’s perfect for displaying on a desk or on the wall. Makes a perfect gift idea for a child you love. Coolest frame you can find anywhere! Perfect for my grandaugher but wish there was one in a color other than pink for my grandson. I have two boys. While I was at a craft convention, I purchased a personalized name frame that contains adjectives of being a boy for my older son. After my second son was born, I have been looking but can't find anything. Now I have found it. BEST ANSWER: Thank you for your question. Click on the personalize button and you will be taken to a page that will ask for the name. Her name will be in the same place Rayna's is in the picture. We hope this information will be of help to you.